For a short getaway to Mount Dora, our Escape Package is just the ticket. Enjoy a three-day, two-night stay in one of our Florida King Rooms accompanied with $20 breakfast dining voucher for each morning ($40.00 value). As part of the Escape Package, you will also receive a welcome bottle of house wine or champagne and a $50 dinner voucher, which may be used in either The Beauclaire Dining Room or Tremain’s Tavern. All taxes are included, gratuities are not. 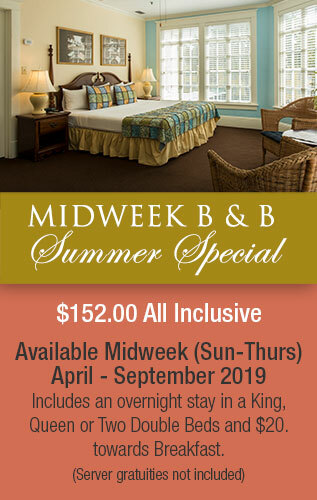 Our lowest rate available for one of our Traditional Florida Rooms with either a king or two double beds. With this rate bed types may be requested, but are not guaranteed.